Régis Labeaume will remain in the mayor's post for another four years, after being elected mayor for the fourth time by Quebec City voters. Régis Labeaume is still the "king" of Quebec City, but he took a slight hit in Sunday's election. He was elected to a fourth mandate with 55 per cent of the vote — a decrease of nearly 20 percentage points compared to his last election in 2013. Labeaume said he was more than happy with the result, saying it shows that citizens in the provincial capital still support his vision for the city after a decade in power. "I know some politicians who would dream [of getting] 55 per cent of the vote, they would trade that with me easily,'' Labeaume said moments after his victory speech. The 61-year-old will face off with a new opponent at city hall. The team of mayoral candidate Jean-François Gosselin, Québec 21, managed to elect two councillors. Gosselin will take the place of his running mate Nancy Piuze, along with Murielle Gagnon who won in the Montcalm Saint-Sacrement district. Gosselin said while he was disappointed he won't see more of his colleagues sworn in, the election of a pair of them was a first step into city hall. 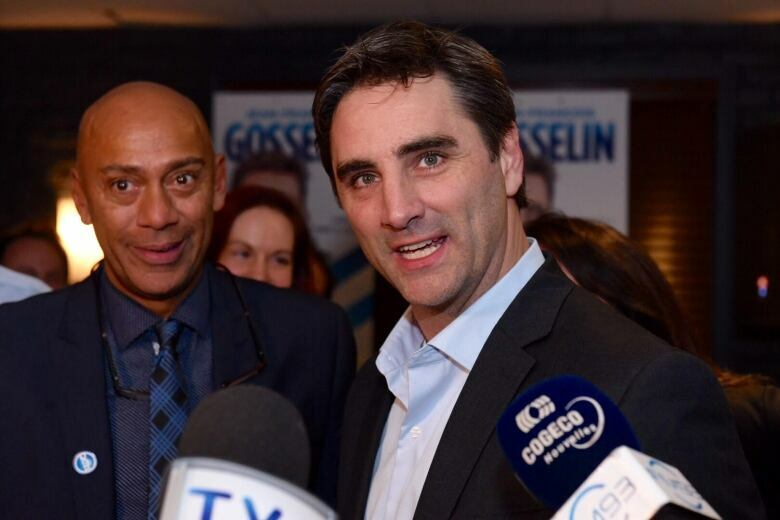 "The work starts tomorrow morning to build our party and win in four years," Gosselin told supporters after the results were announced. The leader of Démocratie Québec Anne Guérette was unable to make any headway in the election. Anne Guérette received 14.6 per cent of the vote. (Julia Page/CBC)Only her co-candidate Jean Rousseau was elected in the Cap-Aux-Diamants district. The 52-year-old said she needed to take some time to think before deciding whether she would remain at city council but was not writing off the future of the party she founded in 2012. "I saw lots of people here who were very motivated to keep the party alive and be prepared for the next election," Guérette said. The working relationship between Guérette and Labeaume over the years has been tense. Guérette has often criticized Labeaume's abrasive style and his approach to citizen participation. Both entered municipal politics in 2007, when Labeaume won the byelection to replace then-mayor Andrée Boucher, who died suddenly in her Sainte-Foy home. Guérette won the city councillor seat for Montcalm in that byelection and has been at city hall ever since. Transportation was a key issue in the campaign, partly due to Gosselin, who tapped into the frustration of many citizens. Gosselin even integrated the issue into his slogan, saying during the Oct. 17 debate that "a vote for Gosselin was a vote for the third link." Building a third bridge or a tunnel between Québec City and Lévis has been a hot topic for several years, an idea some say would be a costly and ineffective way to dissipate traffic jams. Others see it as the only option to relieve the pressure on commuters who rely on the Pierre-Laporte and Quebec bridges. ​After seeing his rapid-bus transit project fall apart only months ago, Labeaume argued that he would need time to come up with a new pitch. In his victory speech, Labeaume promised he would start working on a public transit project on Monday morning. In 2013, 18 of the 21 city councillors were with Équipe Labeaume. That dropped to 17 with this election, with Yvon Bussières winning a seat as independent in the Montcalm-Saint-Sacrament district.